What is the right age to start Puppy Training? The answer is immediately! You want to train and maintain an obedient and balanced dog from the outset. What should you teach your new puppy and when? The first few days at home are extremely important for puppies and with proper instruction they can learn very quickly. However all family members must agree upon responsibility and rules for the new pup and stick to them. Don’t give in to those ‘puppy eyes’. A tiny pup jumping on your lap is cute but not so much fun when he is all grown up and weighs 40kgs! The Dog Whisperer, Cesar Milan states, “The most important thing you can do is become your puppy’s pack leader. You must demonstrate leadership from day one in order to help your pup grow into a healthy balanced dog.” A pack leader is strong, stable, and consistent. Your puppy will sense your confidence levels and will feel obliged to take the position of leader for himself if he perceives you as weak. This can lead to bad behaviours, such as excessive barking, chewing, leash-pulling, or anxiety. Don’t make the mistake of thinking that it doesn’t matter how you teach each of these routines. It does. 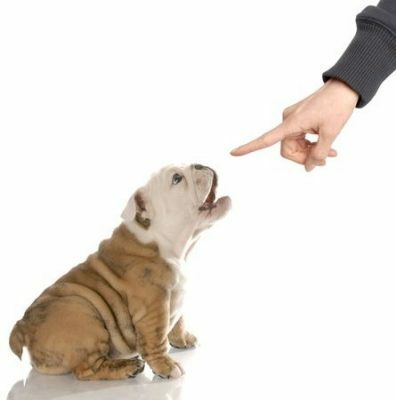 If you do it the right way, your puppy will be better-behaved. Don’t let him get away with things because he is just a pup. This will lead to confusion later when you change the rules. Also if you don’t do this properly now your puppy will be the one making decisions about how he wants YOU to fit into his life! This will lead to conflict and behaviour problems. Puppies don’t mean to misbehave – they are just doing whatever comes naturally. Instead, show your puppy what kind of behaviour it is that you do want. If they are doing something that you do not want tell them ‘No’ and then encourage them to play with a toy, praising them generously. You can only teach your puppy when you are there. Do not tell them off for things that are done that you do not see. When you can’t be there try to keep them in a place where they can’t get into trouble. Decide what praise and correction words you are going to use to train your puppy. Keep them simple, for example, ‘No’, ‘Sit’, ‘Drop’, ‘Down’, ‘Good Boy/Girl’. If you do use ‘Sit’ and ‘Down’ don’t ask your puppy to ‘Sit Down’ as this will lead to confusion. You must teach the words using the right tone of voice and the right body language. Most puppies have to eliminate about every 30-45 minutes except, of course, when sleeping. Their elimination schedule will depend upon when they last ate or drank water; physical activity and also their personal preference! It’s very important that your puppy has a regular and timely feeding schedule. What goes in on a regular schedule will come out on a regular schedule although every pup’s schedule is different. Put your puppy on a regular and timely feeding schedule – in/out clockwork. When house training it is often the case that a puppy is led to the door and on the way they just stop and do their business. Usually this is because they have not developed enough bladder or bowel control to “hold it” until they get to the toilet area or they simply don’t know where the toilet area is. So what you need to do is pick up your puppy and take them to the designated toilet area. Set them down and praise them for going where you want. When you should take your puppy to their toilet area? Immediately upon waking (morning, noon or night). When they whine in the crate in the middle of the night or whine in their pen during the day. Take them out to potty, reward for going and put them right back. When your puppy is standing at the door to the outside. Although tempting don’t just let them out as they may not make it all the way to the toilet area! How long do you need to do this? If you do this with your pup for about one month (until the pup is about 3 months old) this should give him enough time to develop some bladder and bowel control. You will also prevent many mistakes, whilst training a strong preference in your pup to eliminate in your chosen spot. If your puppy is peeing in the wrong place move quickly towards him and pick him up. You need to move quickly without startling him. Take him to the potty area and patiently wait. Most pups will finish there. Reward your pup enthusiastically. If the pup is pooping… let them finish. Puppies are not able to shut off a poop like they can shut off a pee. Never make a big deal about cleaning up after your puppy when an accident occurs. Just before you go to bed and turn out the lights, go get your puppy, no matter where he may be, asleep or not, and taxi him to the potty area. Do the same first thing in the morning. The older your pup gets, the more he will be able to control his bladder and bowels and he will be able to “hold it” for longer and longer periods of time. Don’t forget, most puppies are not completely house trained until they are 6 months old.